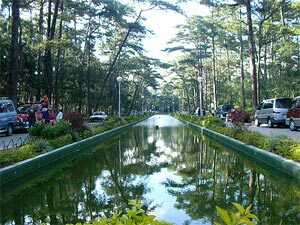 The first thing that comes to mind when Baguio’s Wright Park is mentioned is horseback and pony riding. I can’t remember when I last rode on a horse in Wright Park but I think it was during the 80s when I was still a kid. Now that I’m grown up, the idea of riding a horse has lots its appeal for me. But, horseback-riding here is definitely one of the must-experience tourist activities in Baguio. If you want to see a different side to the “pony boys” of wright Park, check out this feature from Howie Severino’s Sidetrip and if you want tips on how to have your kids enjoy riding the ponies, then this article and this one are must reads. Horseback and pony riding is actually just one of the attractions at Wright Park. (If online sources are to be believed, this area, located at the western end of the park beside the Pacdal Circle, is formally called the Wright Park Riding Circle and colloquially as the near-homophone “Ride Park”. ) A lesser known attraction, but popular among photography enthusiasts, is the “Pool of Pines”. This is a long rectangular shallow pond that leads from the middle of the park to the gates of The Mansion, the Presidential summer residence, to the east. Pictures of this pool are instantly recognizable. There is also a long stairway connecting the pool via a gazebo to the horseback-riding area. Wright Park is named after Luke Edward Wright, the 2nd civilian American Governor-General of the Philippines who governed from 1904-1905. Wright is supposedly the one that commissioned architect Daniel Burnham (after whom Baguio’s Burnham Park is named) to design Baguio as a summer recreational facility for the Americans.